Police Commissioner James O'Neill and Mayor Bill de Blasio talked about New Year's Eve security on Dec. 29, 2016. TIMES SQUARE — The NYPD is ready to handle security pressures from the New Year's Eve Times Square ball drop, Police Commissioner James O'Neill said at a press conference Thursday. This year's terror attacks in Nice and Berlin, which targeted civilians enjoying holidays, prompted the NYPD to augment their strategy for Saturday night's festivities, when the eyes of the world will be on Midtown. "Everybody knows how important this is. Everybody knows that the eyes of the world are upon Times Square on New Year’s Eve. There’ll be no complacency," O'Neill said. "This is where everybody’s gotta be on their toes. I know complacency can set in at times but certainly not at an event like this." Chief of Department Carlos Gomez said New Yorkers and tourists can "expect to see a large increase in security in transit hubs," as well as officers riding the trains, sometimes with K-9 unit dogs, and conducting container and bag checks at entrances. People attending the celebration in Times Square will be subjected to safety screenings at least twice, with metal and radiation detectors and bag checks as they approach Times Square, and again before they enter any of the viewing pens set up to watch the ball drop. Gomez urged people not to bring large containers or bags, backpacks, umbrellas or booze. "You will be turned away," he said. "Alcohol will certainly not be permitted. It will be confiscated by our screening officers." People will be permitted to bring signs, however — including signs protesting President-Elect Donald Trump, according to O'Neill. "People have a right to protest," O'Neill said. "If they’re obstructing the view of other spectators, that might be an issue. Then we might have to take police action there. But, you know, New Yorkers and a lot of people from out of town come to this event and I think people behave very well that night." Besides sand trucks (blocker vehicles meant to keep cars away from areas with pedestrians) and officers with long guns, another new security element this year is the decision to close off 57th and 59th Streets to traffic between 6th and 8th avenue, blocks from the President-Elect's residence. Fifty-Seventh Street will be closed off in the early afternoon on Saturday, Gomez said, then as viewing pens fill up and more are set up to the north, reaching 54th and 55th Streets, 59th Street will be shut down as well. "Please don't drive in this area," Gomez said. "We urge that you take public transportation." Buses in that area will be rerouted, but the subway will continue to run under and around Times Square. Counterterrorism Chief James Waters' team has been preparing for the event "over the last week or so," by sealing manhole covers, mailboxes and trash cans, visiting hotels, "checking parking garages" and having members of the Intelligence Bureau communicate with "large truck rental locations" as part of the NYPD's Nexus program. "We do all the things that we do year-round with events, we just jack it up a bit for New Year's," Waters said. Security has also been beefed up at other events around the city, according to Chief of Patrol Terence Monahan, including the Central Park run and fireworks in Coney Island. The size of the security details at those locations will be larger than in previous years, and there will be sand trucks, blocker cars and "heavy weaponry." In Coney Island specifically, Monahan said there will be blocker cars on every street leading to the boardwalk and on the boardwalk itself. The commanders of every borough unit and precinct around the city will be working through the night, and there will be extra officers on the late tour in every precinct "to monitor every celebration and make sure everyone has a very safe and happy New Year," he said. They will also be "paying special attention to houses of worship," O'Neill said, after threats were made regarding attacks on churches. "So in addition to all of the officers you're going to see in Times Square, throughout the city, you'll be able to find an officer," Monahan said. 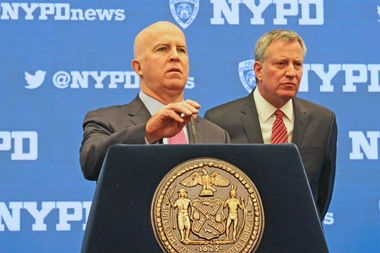 The NYPD will also be conducting "sobriety checks" on drivers throughout the five boroughs.